We’ve done one thing since 1865, and we do it better than anyone else: we protect innovation. Intellectual property is more than forms and court dates. Our work begins while your idea is still developing. We help you identify what is new and valuable in your work and how that can be protected, and we help you steer clear of pitfalls. Once we procure intellectual property rights for your ideas, we handle licensing and help guide you through the next phase of IP ownership. We will also enforce your IP rights and defend you against claims of infringement when necessary. In 1865, returning Civil War Colonel Thomas S. Prague founded the first patent practice in Michigan. In 1891, the successors of that practice helped found the Detroit College of Law, predecessor to the Michigan State University College of Law. So began our long history as academic thought leaders in intellectual property law. In 1865, returning Civil War Colonel Thomas S. Prague founded the first patent practice in Michigan. In 1891, the successors of that practice helped found the Detroit College of Law, predecessor to the Michigan State University College of Law. So began our long history as academic thought leaders in intellectual property law. In 1913, our members cofounded the Michigan Patent Law Association, known today as the Michigan Intellectual Property Law Association (MIPLA). Elijah J. McCoy—19th-century African-American inventor whose widely sought-after method for lubricating train engines is the origin of the phrase “the real McCoy.” The Elijah J. McCoy Midwest Regional USPTO is also named for him. Ransom E. Olds—Designer of the first commercially successful mass-produced automobile and namesake to the Oldsmobile brand. David D. Buick—Inventor of the seminal overhead valve engine and founder of the Buick Motor Company. Michael J. Owens—Manufacturing pioneer who invented an automated way to make glass bottles. We are proud to still represent some of the namesakes and successors of these luminaries and to help carry on the tradition of bold innovation that they began. We are not only lawyers—we are thought leaders. Our attorneys have taught IP law at Wayne State University, the University of Detroit Mercy, and the Ave Maria School of Law. Our firm also helped found the Detroit College of Law, now the Michigan State University College of Law. Our attorneys have for decades authored "Cases and Materials on Patent Law: Including Trade Secrets, Copyrights, Trademarks," part of the American Casebook series and an essential textbook for patent law in accredited law schools across the U.S.
We continue to shape the profession by regularly publishing articles and speaking at conferences about IP topics. You can read our latest publications in our What’s New section. We are experts in every aspect of the patent application process, from the initial concept of the invention to the payment of the issue fee. Through decades of experience in innumerable technologies and scientific disciplines, we are ready for virtually any invention that comes across our desk. The appearance of a product is often as integral to its success as its function. We are experts at procuring and enforcing design patents in the U.S., whether those rights stem from a regular design application or an international design application under the Hague Agreement. We have obtained design protection for products as diverse as automotive replacement parts, bottles, jewelry, and furniture. We understand that trademarks are crucial to a company’s identity and a primary way to communicate value to your audience. Though first use of a trademark usually confers ownership, it will not empower you to defend it—and trademarks should never be taken for granted. A trade secret is knowledge that has value to you because no other company has it. Trade secrets can have a perpetual term, but there is an ever-present risk that a competitor may independently develop, patent, and use your trade secret. We help clients identify trade secret subject matter, advise clients on safekeeping of trade secret information, and enforce trade secret misappropriation cases. Ownership of an original work is automatically conferred to its author. But with many creations, the originality of your idea may be challenged and hard to defend. Additionally, preventing and responding to infringements is more difficult if you have not properly registered your idea and communicated your claim to the public. We’re proud to have attorneys selected year after year to the Michigan Super Lawyers™ list, a ranking of lawyers who have attained a high degree of peer recognition and professional achievement. 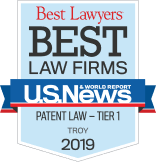 We’re also excited to work with attorneys who have been named “Top Lawyers” by dbusiness® magazine’s annual peer survey of the Detroit metropolitan area.